A. Lange & Söhne turned 200 years old this year, and to celebrate the exceptional milestone, the German watch brand unveiled several beauties. First up, Lange introduced three charming Saxonia watches. They were elegant, and we instantly had a thing for them, as you can tell from our Hands-On. But then, the German brand unveiled a true stunner: the Zeitwerk Minute Repeater. And to be honest, she is the one that’s been stuck in our minds since we left Geneva. A. Lange & Söhne have a reputation – and a good one at that – for keeping things traditional. If it ain’t broke, don’t fix it. And the Zeitwerk is Lange’s exception to that rule. With it, the brand gives itself a little more room for maneuver and instead of using hands, diplays the time with an hour ring and two minute discs. Of course, the Zeitwerk is the model that brought us the Striking Time, the world’s first mechanical wristwatch with a jumping numerals display and a visible chiming mechanism. But somehow, it only reminded us of one thing: A. Lange & Söhne still didn’t have a minute repeater. All truth be told, we’ve been expecting a minute repeater from A. Lange & Söhne for a while, and our hopes were at an all time high this year, as anniversaries usually come with a few gifts. That is all the more true with the Swiss watch industry. However, not all of us were ready to put any money on the Zeitwerk being the model that would house the complication, the hardest to manufacture by the way. But A. Lange & Söhne is now part of that exclusive club, and boy did they announce their arrival in style. The Zeitwerk Minute Repeater is the first A. Lange & Söhne model with a striking mechanism that sounds the hours, ten-minute intervals, and minutes, but it also combines a mechanical jumping numerals display with a decimal minute repeater. Aesthetically, it’s really well thought out. “See it, say it” is a rule that every broadcast journalist knows very well. Here A. Lange & Söhne has adpated it to its own tune. “See it, hear it.” The acoustic sequence precisely reproduces the digitally displayed time whenever the mechanism is triggered, with hours sticking on the left, and single minutes on the right. So does it sound good? Undeniably so! A low-pitched tone sounds for each elapsed hour, a double tone for each elapsed ten-minute period, and a high-pitched tone for each elapsed minute. Could it sound better? Perhaps if it had come in another material. While the subject is open for debate, we can’t but image the sound of the minute repeater, had it been cased in steel or titanium. Hublot certainly showed what the latter could do, when the Classic Fusion Cathedral Tourbillon Minute Repeater won the Striking Watch Prize at the Grand Prix d’Horlogerie de Genève 2014. 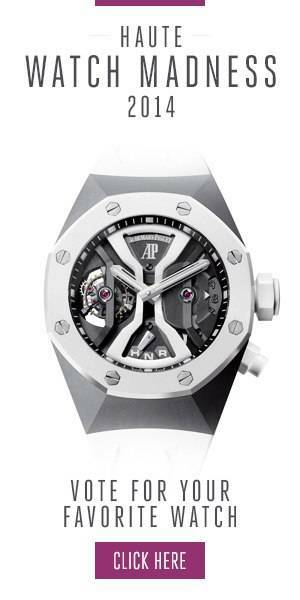 And in terms of minute repeaters, Audemars Piguet’s RD1 concept stole the show at SIHH. The A. Lange & Söhne Zeitwerk Minute Repeater will be highly limited, and will retail for € 440,000 in platinum. Photo Credit: Haute Time. For more information, please visit the official A. Lange & Söhne website.